USDCHF is chiefly affected by the Switzerland’s foreign currency reserves report and will be influenced by Switzerland’s consumer price index data for April soon. USDCHF is moving with bullish bias at the moment. 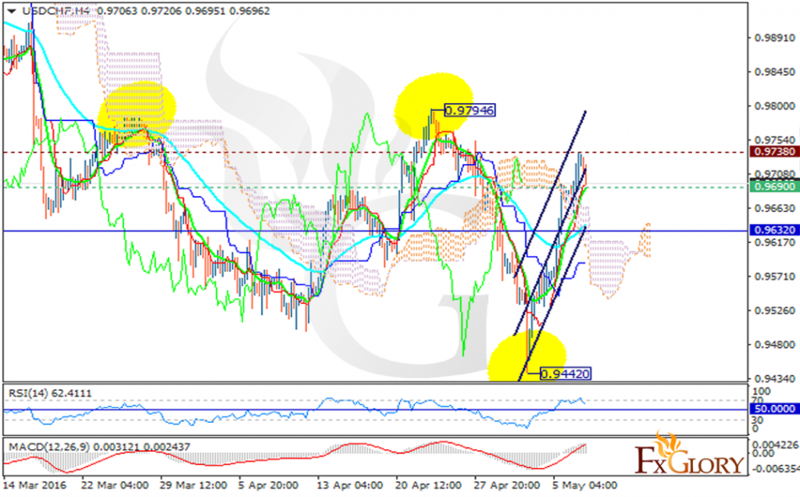 The support is at 0.96900 with resistance at 0.97380 which both lines are above the weekly pivot point at 0.96320. The price is above the Ichimoku Cloud and the Chinkou Span. The Kijun-sen and the Tenkan-sen are both showing downward trend. The MACD indicator is in positive territory signaling the price growth and the RSI is above the 50 level confirming the buy signal. There is a good chance of resistance level breakout for now. Long positions are recommended with the target at 0.9850.